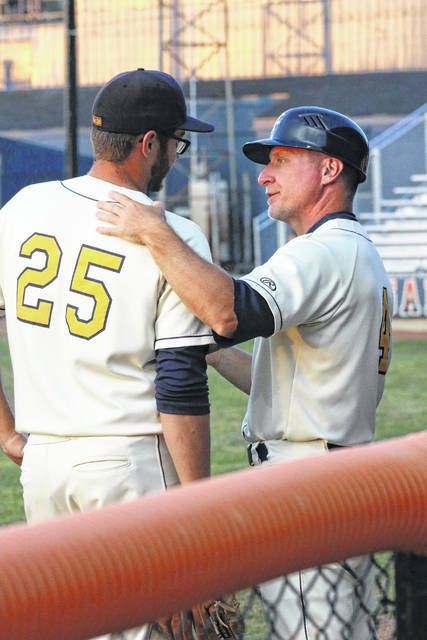 GALION — On an ideal evening for baseball, the Galion Graders welcomed the Irish Hill Leprechauns to Heddleson Field in Heise Park to play in the first of their two-game series on Thursday, July 12. After dropping two games in a doubleheader to the St. Clair Green Giants the night prior, the hometown Graders were looking to get back on track against the visitors and did so in a big way, earning a hard fought victory by a final score of 13-10. The win moves Galion to 13-14 on the season and Irish Hills drops to an even .500 at 14-14 as they saw their three-game winning streak snapped. Newcomer Preston Stanley got the nod as the starter for the illness-stricken Graders and worked a perfect 1-2-3 inning in the top of the first. In the home half of the opening frame, Galion saw Jose De La Cruz lead-off the contest with a single but would later be erased from the bases on a Jacob Reimold 5-4 fielder’s choice. Reimold would be stranded at first after Juan De La Cruz grounded out to second to end the first with the game still scoreless. In the second, Irish Hills used a pair of hits, a single and a double, in conjunction with a walk and one of four stolen bases on the evening, to take an early 2-0 lead. The rally came with two outs in the inning for the Leprechauns offense. Galion would get two runners on the bases thanks to a walk to lead-off hitter Austin Hathaway, followed by a single off of the bat of Vince Donato. With runners at first and second and nobody out, Seamus Kenneally laid down a sacrifice bunt to put both Hathaway and Donato in scoring position for the remainder of the bottom of the line-up. However, Cole Andrews and Christopher Jordan would both go down on strikes, ending the threat and squandering the scoring opportunity. After five pitches and two quick outs to begin the third inning, Stanley hit Irish Hills batter Maxx Mahon for the Leprechauns first base runner in the frame. In stepped Tommy Pellis, who would be given first on four straight balls and the rally was alive and well again for the visitors. Nick Neibauer would walk as well to load the bases with two outs in the inning to send up Ryan Guckin. Guckin seized the oppoturnity to put more runs on the board and delivered a two-run single to plate both Mahon and Pellis and put his team up 4-0 heading into the bottom of the third as Irish Hills would leave the bases loaded following another walk. Galion would not record a hit in the portion of the inning but, after a walk, Todd Sekowski would steal both second and third base to put himself in prime position to get the Graders on the board. Juan De La Cruz would reach on a hit by pitch after a Reimold strike out but a flyout to center field by Hathaway ending the inning as Galion stranded runners on the corners to remain scoreless. Irish Hills would eventually load the bases in the top of the fourth, despite not recording a single hit but would leave them stranded after Bucyrus native Gavin Lewis came on with two outs in the inning to get Neibauer to groundout to first to end the threat and keep the score at 4-0. In the bottom of the fourth, the Graders’ offense would wake up and in a big way. Donato walked to start the rally, followed by a Kenneally single. With runners at first and second, Andrews went down on strikes for the second time in the contest and Jordan proceeded to flyout to second. Now with two down and two on, Jose De La Cruz drew a walk to load the bases for all-star Sekowski. Sekowski wasted little time in his at bat, ripping the first pitch that he saw deep and long gone for a grand slam, his first homer of the season, to knot the contest at 4-4. Zach Frieling would have an answer for the Galion push as, after two walks to begin the fifth, he crushed his first home run of the season to plate three and move Irish Hills back on top; 7-4. Lewis would settle in on the mound and get the next two batters via a strike out and a groundout to send up Thomas Miller. Miller would rip a shot into center field but would get greedy trying to stretch his double into a triple and was gunned down at third thanks to a Sekowski to Jordan to Reimold putout. 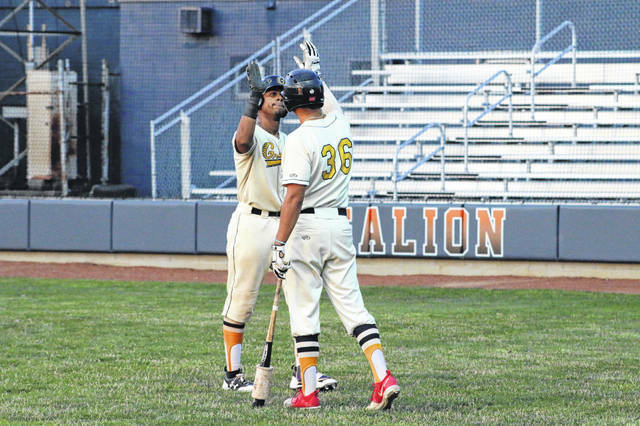 Juan De La Cruz was set to lead-off the Galion fifth and did so in a resounding manner, belting a solo, opposite field home run, his fifth of the summer. Hathaway would then be walked for the second time in the game and would eventually come around to score on a two-out, RBI single from Andrews. The Graders would trail at this point; 7-6. The runs kept tallying in the sixth for the Leprechauns as they would see more runs come across to score, despite only hit in the frame. That one hit was a two-run, RBI single from Adam Furnas with just one out. After loading the bases and recording the second out, Lewis would exit the game and Galion native Mac Spears took the hill in the high-pressure relief scenario. Spears would allow a run across, credited to Lewis, via a wild pitch but would get Noah Suarez to groundout to short for the third out, leaving two runners in scoring position. In the bottom of the sixth, Sekowski would reach on a one-out double and move over to third on a failed pick-off attempt but he, alongside Juan De La Cruz (walk), would be stranded on the base path to send the contest into the seventh with the Leprechauns now up 10-6. Spears would get Irish Hills in order in the top of the seventh to send the hometown Graders to the plate still down four runs. That deficit would more than be erased in the home half and began with four consecutive singles by Donato, Kenneally, Andrews and Jordan with Donato and Kenneally scoring after Andrews’ at bat via a throwing error by Leprechauns’ pitcher Axel Bueter. Jose De La Cruz and Sekowski would be retired via flyouts, sending up Reimold with two down and Jordan at first. Reimold would rip Galion’s fifth single of the inning and move Jordan all of the way to third. With runners now at the corners, Juan De La Cruz doubled to score them both and keep the rally alive. The ninth batter of the inning would be Hathaway and he would connect for a single to plate Juan for the Graders sixth and final run in the inning after Donato, in his second at bat in the frame, grounded to the Irish Hills second baseman who tossed to second to erase Hathaway and end the huge bottom of the seventh. Heading into the eighth, the Graders now found themselves in the driver’s seat with a 12-10 lead. The Leprechauns offense would be kept at bay by Spears in the eighth to preserve the two-run lead and send Galion back up still in control. The Graders would record just one hit in the bottom of the eighth but it was a big one as Andrews crushed a solo home run, his first of the season, to the deepest part of the field in center to add the insurance run and put the home team up; 13-10. Bailey Durocher came on in the top of the ninth in his first mound appearance of the summer and got the Irish Hills and walked the first batter he faced to give the Leprechauns hope. That hope quickly diminished however as Durocher would strike out the next three batters to earn the save and give Galion the three-run victory. Spears would end up with the victory for the Graders, recording 2⅓ innings while not allowing a single hit or run. Durocher picked up the save, going just the one inning while walking one and fanning three. Stanley had a bit of a rough go to start the game and ending up going 3⅔ innings, allowing four runs (all earned) on three hits and notching six walks and three strike outs. Lewis pitched two official innings on the evening, giving up six runs (four earned) on three hits, walking five and striking out a pair. Irish Hills plated their 10 runs on just six hits; two doubles, a home run and three singles, while stealing four bases on the night. Galion racked up 15 hits en route to their 13 runs in an offensive explosion. In the field, the Leprechauns committed two very costly errors while the Graders had just one miscue. Offensive statistics for the home squad on Thursday were: Team- 15/38 at the plate; 10-1B, 2-2B and 3-HR; 13R, 11RBI, 2SB, 6BB, 8K and 9LOB; Jose De La Cruz- 1B, R; Sekowski- HR, 2B, 4RBI, 2SB, R; Reimold- 1B, R; Juan De La Cruz- HR, 2B, 3RBI, 2R; Hathaway- 1B, R, RBI; Donato- 2-1B, 2R; Kenneally- 2-1B, 2R; Andrews- HR, 2-1B, 2R, 2RBI and Jordan- 1B, R, RBI. Every Graders hitter had at least one hit and one run scored in their offensive onslaught over the Leprechauns.